You often hear people who are visually or hearing-impaired, or who live with a debilitating physical condition like MS or some other challenge, say that they wish others could see past the “disability” and see them for who they are. People are complex. Nobody wants to be defined or limited by a single aspect of their existence. There are plenty of people, heroes, really who live with disability of one kind or another in such an inspiring way that they make us forget they have it. We’re beginning a series here about such people, people who have made enormous contributions to the world, to humanity, in spite of having to deal with some truly daunting challenges in their lives. He’s arguably the most famous scientist in the world today. We’ve all seen him, his body twisted and contorted, his speech unintelligible without the computerized vocal synthesizer he uses to lecture. If we saw this man on the street [and we do see men just like him almost every day of our lives], we might be inclined to look away, perhaps feeling pity or a sense of outrage at the unfairness of life. That wouldn’t do anyone, least of all the person who prompted the reaction, any good at all. Stephen Hawking knows this better than most. He has ALS, a motor neuron disease that he has lived with now for more than forty years. There’s no cure, nor even any really effective treatment for it. It just gets worse and worse. And that would be enough to make anyone depressed. The realisation that I had an incurable disease, that was likely to kill me in a few years, was a bit of a shock. How could something like that happen to me? Why should I be cut off like this? However, while I had been in hospital, I had seen a boy I vaguely knew die of leukaemia, in the bed opposite me. It had not been a pretty sight. Clearly there were people who were worse off than me. At least my condition didn’t make me feel sick. Whenever I feel inclined to be sorry for myself I remember that boy. Where do we come from? How did the universe begin? Why is the universe the way it is? How will it end? All my life, I have been fascinated by the big questions that face us, and have tried to find scientific answers to them . . . I want you to share my excitement at the discoveries, past and present, which have revolutionized the way we think. You can hear the excitement in his words. Would you know, reading these words, that their author had an incurable disease that left him helpless and totally dependent on others? Hardly. Hawking’s best-known book, A Brief History of Time, has sold more than ten million copies since he published it in 1988. In it, Hawking tries to explain to a layperson the difficult notions of the Big Bang and black holes. He has written many articles and books, both for the scholars and for the general reader. His latest book, The Grand Design, came out in 2010. Here he argues that we don’t need God to explain the universe, just the laws of physics. 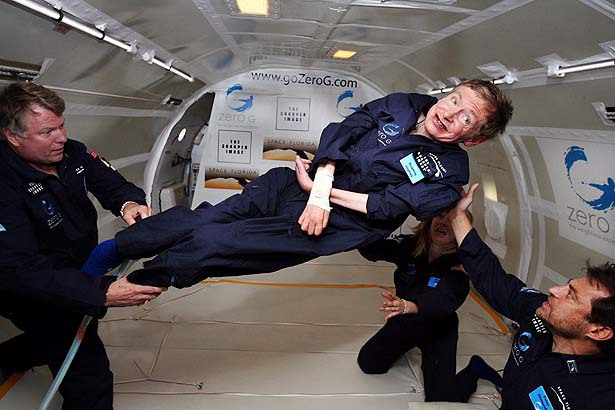 Professor Hawking has twelve honorary degrees. He was awarded the Commander of the British Empire (CBE) in 1982, and was made a Companion of Honour in 1989. He is the recipient of many awards, medals and prizes, is a Fellow of The Royal Society and a Member of the US National Academy of Sciences. Here is a man who can’t speak unaided, can’t walk, can’t feed himself or care for himself in any way. Without round-the-clock assistance, he literally couldn’t live.